For those who’ve been through it, Crash the GAC is not for the faint of heart. Instead it’s for the curious, enthusiastic and highly engaged young (or young at heart) credit union professionals that desire to learn the ins and outs of what it means to be a credit union advocate. There’s arguably no better place to do this than at CUNA’s Governmental Affairs Conference (GAC), the industry’s largest advocacy conference. This year, the Cooperative Trust in partnership with CUNA welcomed 100 crashers, including five from the Carolinas. Their experience included attending special events during GAC, participating in sessions and networking events, and hiking the Hill with the Carolinas Credit Union League delegation. This year’s crashes include: Andrea Finley, SC Telco FCU; Hannah McGee, Palmetto Citizens FCU; Barbara Mojica Arzate, Coastal CU; Morgan Travis, Telco Community CU; and Amanda Vaughan, Coastal CU. Reflecting on their experiences, the Carolinas’ crashers share their most notable highlights. Coming in as the number one most-talked-about aspect of the Crash the GAC is the robust agenda and speaker lineup. Participants quickly realized the experience was more than a crash course in advocacy but a deep dive into career development, purpose, passion, and more. Andrea: As young professionals we sometimes struggle with our career journeys. Everything from the personal development sessions to the crasher-specific speeches delivered by incredible leaders like CUNA President/CEO Jim Nussle and National Credit Union Foundation Executive Director Gigi Hyland helped me realize the importance of young professionals. Hannah: We discussed personality types, diversity, how to stand out in the workplace, staying organized at work, and finding your passion. The Crashers program is not just a way to attend the CUNA GAC but an event designed to develop young professionals. Morgan: We listened to multiple speakers both in the general sessions and in Crasher-only sessions. Each one delivered career-changing advice and further motivated us to spread the credit union message. I learned many lessons from these speakers, and I have no doubt that they will have a positive impact on my career! Barbara: Every day after GAC, I wake up thinking about this statement that was said by Antonio Neves at one of our sessions, “If your boss had to hire based on the last 30 days of your performance, would they still hire you?” This is now something that I live by. I want to make sure that the time, resources and the mentoring that has graciously been invested in me by my credit union pays off. After two days of networking, information, and motivation at the CUNA GAC, our five crashers joined more than 150 credit union leaders from the Carolinas to participate in "Advocacy in Action" on Capitol Hill. During this time, they gained a better understanding of the importance of advocacy. Andrea: Hiking the hill gave me a chance to see our advocacy in action. I realized we cannot expect our legislators to vote on our behalf unless they hear from us. Hannah: Having the opportunity to speak with South Carolina senators and congressmen about the issues that impact our existence is necessary, but also a reminder that we have ways to speak to our leaders any time. Our advocacy cannot just be when we visit the State House or Capitol for a visit or rally. Morgan: We had the opportunity to speak to Senator Burr and multiple congressmen and congresswomen about the importance of credit unions and how special they are. It was a fun opportunity to spread the message of the credit union difference and to be an advocate for credit unions and our members. Some of the most highly anticipated parts of the annual CUNA GAC are opening day ceremonies (including flag presentations) and The Foundation’s Herb Wegner Memorial Awards Dinner. Woven into the Crash the GAC agenda, crashers had an opportunity to be part of both. Andrea: Sitting in a room with over 5,000 fellow credit union advocates for the flag ceremony—witnessing each state flag presented by credit union representatives (including some crashers) was powerful and moving. It reminded me that I am a part of something much bigger than my credit union. As a movement, we are impacting many lives across the nation, and learning about the Open Your Eyes campaign sparked an internal flame for me. Amanda: The evening of the Herb Wegner Dinner was one of my favorite parts of the GAC. It was such a special opportunity to take time to recognize some of the most influential individuals in our industry who are making a real impact on members’ lives every day. Morgan: The awards dinner was so inspiring! It was a great reminder of the impact we can have in our communities. An integral part of the 2019 Crash the GAC program is mentoring. A concept the Carolinas Credit Union League can get behind as it continues its sixth year of the CUaware Mentor Program. Mentoring in any capacity goes a long way to enhancing any professional’s personal and career development. Amanda: Our group of 100 crashers was divided into smaller subgroups and were each assigned a mentor. Not enough can be said about the wonderful team of mentors selected for this year’s Crash the GAC. They were committed to making this opportunity as valuable to us as possible. On the first day, each mentor had the opportunity to speak on a topic that was near and dear to them. Each one brought a new perspective and set of ideas to our group, but the passion that they showed for their work and the credit union movement inspired everyone. Diversity presents opportunity. A point CUNA made clear throughout the GAC. From a panel discussion on the importance of diversity in credit union leadership to Local Government FCU CEO and outgoing CUNA Chair Maurice Smith’s call for adding diversity and inclusion as the eighth credit union principle, the industry is taking a proactive stance to meet the needs of a more multicultural nation. Barbara: A sticking point for me was the call to action for diversity. As a minority, this one impacts me personally; the reason why I went to GAC was because I also have a call to action that falls under diversity. So, to see that credit union leaders across the nation are actively seeking to make diversity part of our principles reassures me as a minority that change is happening, and that I am in the correct industry. As part of celebrating its 10th year of the Crash the GAC program, The Cooperative Trust accepted 100 crashers (at least one representative from each state). And despite this being the largest group to date, participants managed—through small group activities and roommate bonding—to connect with each other on a personal level which left a lasting impression. Amanda: I was most apprehensive about [the idea of having a roommate] but it surprisingly ended up being one of my highlights. Seeing as I hadn’t had a roommate since college, I was nervous about sharing a standard hotel room with a stranger. My worries were unfounded and my roommate and I clicked instantly. We spent a couple of hours every night just talking and reflecting on the events of that day, and having that opportunity to debrief with someone added value and insight to the experience. Andrea: Experiencing the GAC with 99 other young professionals is an experience I will remember for the rest of my life. Barbara: It is a life-changing experience. Interacting with people you don’t get to daily is powerful. It reassured me that the credit union industry has been in good hands and will continue to be for generations to come. For anyone that is currently thinking about applying--do it! It will change your life, and the best part is that you will have friends for life who share the same passion as you. 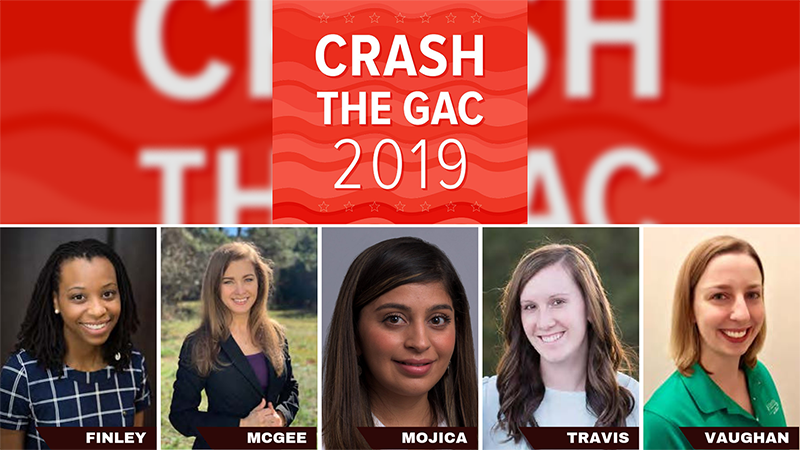 Enjoy this slideshow of the 2019 Crash the GAC. To learn more about Crash the GAC, visit cooperativetrust.com/crashthegac or contact The Cooperative Trust’s Lauren Culp at laurenc@filene.org.